Since he began composing in the early 1980s, composer Daniel Buckley has been strongly attracted to the spoken word in creating music. The two can work together or apart, and that has been the foundation of a great deal of Buckley’s work involving spoken word. At times Buckley has turned to found spoken sources – sermons of preachers, the playful voices of children, speeches (and missteps) of politicians, historical oddities and more. The numerous audio tapes found in Jonestown, Guyana in 1978 following the “mass suicide” of 900-plus followers of the Rev. Jim Jones have found their way into a number of works by Buckley, and continue to be a prime source as he works toward a Jonestown opera. 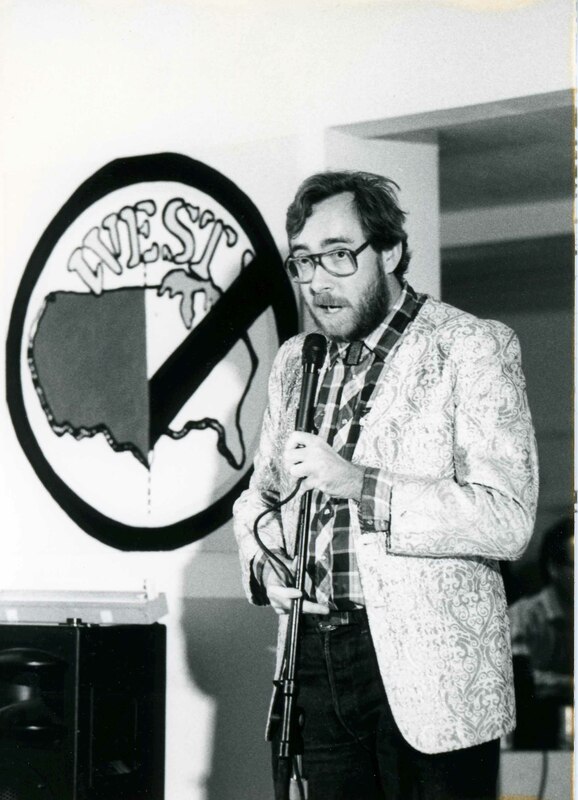 A humorous musical piece from the mid-1980s titled “Eyes on the Cornbelt,” which used Buckley’s speaking voice, became the foundation for a popular dance setting by then San Francisco choreographer Gail Chodera. Below are some examples of Buckley’s spoken word pieces. Please note that some of these are pure research works intended to study a particular process with no direct intent to complete a musical piece. But they represent an important part of the composer’s sonic evolution. Carnival Girls X – “The Carnival Girls” is a piece from Buckley’s “toy music” phase of the mid-1980s, with lyrics by Buckley. No News is Good News 1X, No News is Good News 2X – “No News is Good News” is a tape loop study from the early 1980s. Audio tape from broadcasts of coverage by Spanish and American stations of the Reagan assassination attempt were cut into various irregular lengths, then played against one another while various effects and processes were applied. Fine and Powdery X – “Fine and Powdery” uses sample looping and vocoder technology from the 1990s. An excerpt of studies for Buckley’s Apollo Suite, the source vocals are those of astronaut Neil Armstrong discussing the texture of the lunar soil. Isn’t That Just Like Jesus X – “Isn’t It Just Like Jesus” is another tape loop piece from the early 1980s, set against a slowed down recording of a metal xylophone. The voice is a preacher talking about speaking in tongues. Experience of Trance X – “The Experience of Trance” is a late 1980s sample loop study with the loop unaltered on one channel and modulated with a triangle wave on the other. The vocal track comes from an anthropologist talking about trance around the world. Work song x – “Work Song” matches up an improvisation for bowed banjo and harmonica with a prison chain gang work song. In the Moonlight X – “In the Moonlight” is a spoken excerpt from the opera “West],” set for banjo and voice. Buckley wrote both words and music. More recent examples (from around 2012) of studies for the Jonestown opera can be found by clicking this link. Earlier examples of Jonestown-related musical examples can be heard by clicking this link. ~ by Daniel Buckley on March 25, 2013.